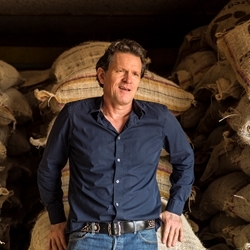 From growing up on a remote Irish island to buying a cacao farm in Venezuela and making incredible chocolate in rural Devon, Willie Harcourt-Cooze has certainly had a life full of adventure. His Willie’s Cacao chocolate bars are true examples of bean-to-bar, and he travels the world sourcing the finest cacao to bring back home. Willie has also appeared in two television series about his chocolate-making adventures, and spends a lot of time coming up with new ways to use chocolate in cooking.